Conor MacRae's whole life revolves around hockey. Both he and his dad make sacrifices so that Conor can play on an elite hockey team. Even though almost every waking minute involves hockey, loves everything about it. When his dog, Sinbad gets sick with cancer, Conor has to choose between payments to the vet for chemotherapy sessions or hockey lessons. Once Conor steps back from everyday lessons, he has time to notice things he hasn't noticed before like his dad's crying and somber moods and even the lack time with his mother's Japanese family. Maybe, just maybe he the hockey rink isn't the only place Conor belongs. The elite athlete will relate to the time spent perfecting the sport but the heart of the story lies with the relationship outside of the rink. Get ready for the excitement, for the stomping of feet, the hooting and hollering and the for clucking. Wait! What do the rules say again? 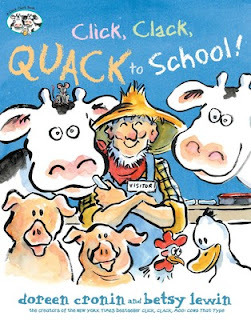 On Wednesday, Farmer Brown gets an invitation to be a guest at Dinklemeyer Elementary School and to "Bring the animals too." He rushes to get the animals ready. With all of the excitement, the cows moo, the chickens cluck, and the pigs oink but Farmer Brown explains that school is serious and quiet. The animals must obey the rules. Suddenly school doesn't sound so fun. When the animals make it to school and the recess bell rings, things get a little wacky. While the silly story starts on a promising note, the ending falls a little flat. Somehow, I feel like I missed the punchline. A silly but quick read for those who enjoy the Click, Clack series. 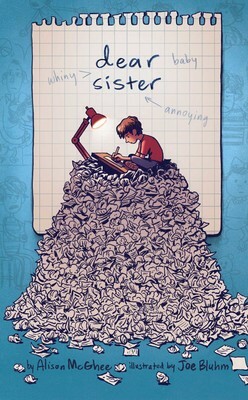 "Dear Sister," so begins a series of letters written by an older brother to his annoying sister. The letters follow the rocky start when little sister comes home from the hospital to sweet overtures when big brother leaves for college. The brother grades his sister on whininess, annoyingness, afraid of the darkness and refusal to eat lima beans. Readers will love the humor of the brother’s candid reports and letters. Subtle changes in the letters as the sister grows expose surprise feelings. Careful attention to the simple handwriting and childlike sketches by Joe Bluhm give additional clues to feelings the brother has toward his sister and vice versa. Definitely worth spending time poring over the illustrations and comparing them to written words. No boy should with a little sister should miss Alison McGhee’s touching story, best described with three H’s: honesty, humor and heartwarming. 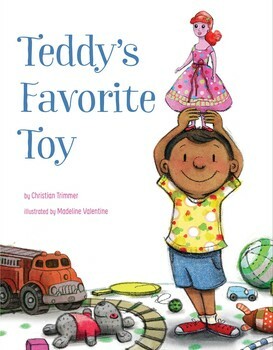 Teddy never has a dull moment in his room with all of his cool toys ranging from hula hoops to fire trucks. One toy takes center stage as his all time favorite, Bren-Da, Warrior Queen of the Pacifica. Bren-Da has the best manners and the sickest fighting skills. When Bren-Da's leg snaps off, Teddy tries to no avail to fix her. Instead, he leaves her wrapped in bandages and heads off to school. He returns to find Bren-Da missing. Seeing his dismay at losing his favorite toy, his superhero mom pulls out her special skills to go for the rescue. Can she do it? A touching look and what it means to get past gender stereotypes. Great for those who aren't afraid of what others think. Zayd loves being on the best team in the fourth grade. With his hard work attitude, he's sure the season will be amazing. With his best friend, Adam, on the team, how could it not be? The team gets off to a rough start, with some losses. To make matters worse, Adam decides to drop off the team and play football instead. His new friends take him from Zayd, leaving Zayd bewildered and discouraged. As if life at school and on the team aren't bad enough, Zayd's home life is so centered on his uncle Mamoo's wedding preparations that nobody seems to notice his disappointment. 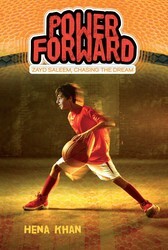 Luckily, Zayd continues to work hard while immersing himself in his culture and family. In doing so, he comes to some small realizations about life he passes on to his uncle. 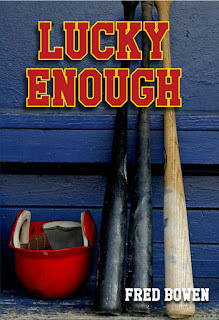 A charming look into family through sports. Zayd knows he must practice hard and often to make the gold basketball team, especially since he's smaller than the other guys on the team. Unfortunately, skipping orchestra practice to sharpen his skills does nothing to advance his goals. When his mother finds out Zayd has traded his violin for basketball, she grounds him for the two weeks leading to try outs. Not only is he not allowed to play basketball, he's not even allowed to talk about it. Even worse, his punishment doesn't end until after try outs, meaning he will have to miss them. Zayd's Pakistani-American family lends support in distinct generational ways but will their firm but loving stance be enough to get him through? 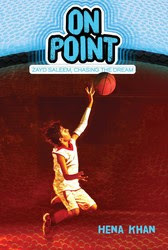 In the end, honesty and understanding on both sides endears the reader to Zayd and his family. 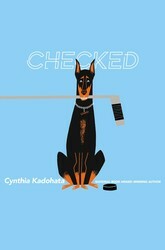 A solid start for the series, Power Forward will have the young reader wondering what happens next. Little car doesn't want to go to bed. Instead he zips around town saying goodnight to all of the other vehicles he's friends with. From honking to tractors to hearing toots from taxis and buses, Little Car enjoys his night on the town. When the ferry arrives to take the last load of cars, Little car motors on to the waiting platform. With sleepy eyes, Little Car tries to make it back to his garage. Will he make it? 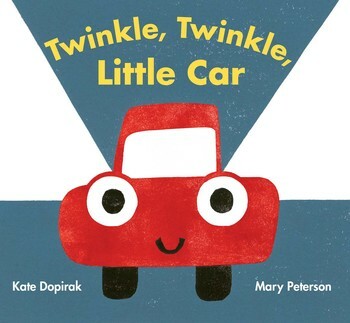 Though the rhyme works with the tune of Twinkle, Twinkle, Little Star, it's also perfect to read aloud. Shades of blue have a calming effect parents will love at bedtime while the budding reader will love the Little Car's bright color. 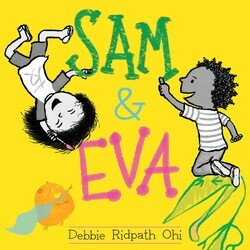 A solid bedtime story that youngsters and parents will enjoy over and over again. When he sees a fancy car drive by, Mike asks his dad why he doesn't have a car like that. In jest, his dad points out that the car only seats two and they have a family of three but if he didn't have Mike then he could have a car like that. Mike joins the playful antics by declaring that, "I could eat candy for every meal... if I didn't have you." But his dad one ups him, "I could take sky-diving lessons...if I didn't have you." Through wit and humor the father and son admit having each other is better than joining a circus and following a dream to join a rock band. The playful story takes a hilarious turn when Mom arrives to join the teasing. 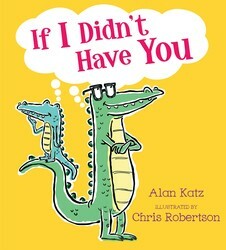 The bright colors of Robertson's digital illustrations enhance the light-hearted family relationships woven by Alan Katz. A perfect Father's Day addition to the family library. Moving to a new house is hard enough. But for a normal kid like Andres, his move proves far from normal. In fact, he discovers his house is haunted after weird things start happening like silverware flying out of drawers and furniture rearranging itself. Andres' parents don't see what he sees, leaving Andres scared and alone. Alas! 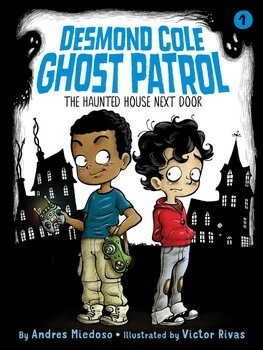 Along comes his not so weird neighbor, Desmond Cole, Ghost Patrol with his ghost gadgets . Together they discover Zax, a friendly ghost living in the basement. Andres can't help feeling sorry for the ghost after he gets sick eating lasagne and strikes an agreement with him. Will it be enough to calm Andres' fears? Stay tuned. 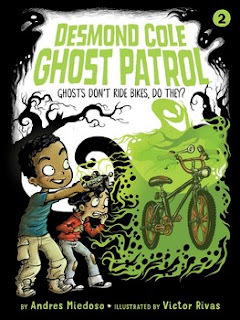 Andres Miedoso's Desmond Cole Ghost Patrol Series strikes a new friendship and a new chord for young readers making the transition from picture books to chapter books. Short chapters with simple words and plenty of illustrations make the transition smooth. An engaging storyline helps encourage the reader to follow through to the very end and will hook the reader with anticipation for the next book in the series. Trey's lucky token, a piece of blue sea glass he found with his grandmother, has brought a string of good luck. His performance on the baseball field exceeds his expectations and he scores well on tests at school with very little effort. When he makes the Ravens team, he carries the piece of glass with him during every play, hoping it will continue helping him with his lucky streak. His luck turns when Trey loses his precious shard of glass. 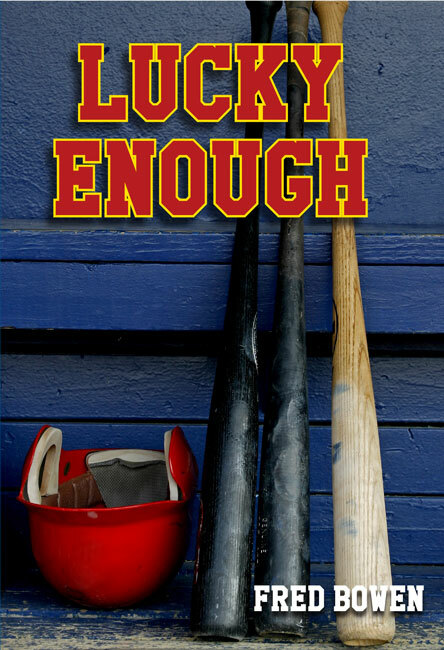 When his mom and uncle reminisce at dinner about their mother's work ethic, Trey comes to the conclusion that he has put too much emphasis on his grandmother's "lucky enough" sign. Could it be that his grandmother felt stronger about hard work leading to success rather than luck and that his good luck charm really doesn't matter? Detailed descriptions of all things baseball, including practice and games by Bowen will have the young sports enthusiast fully engrossed in the game. Even better, the subtle life lesson of the value of work will make an impression on the back of the mind. Fun facts about about the rituals of famous baseball players make a good bonus read. Cruelty and hard work make up the only life Lambert Simnel has ever known. Orphaned as a young boy, Lambert doesn't know anything of his past, not even his real age. The whisper, "Boy, I know who you really are," of the friar, Brother Simonds give Lambert a hint of his destiny. Brother Simonds purchases Lambert and takes him away to school him on the art of becoming king. According to Brother Simonds, Lambert is the previous king's nephew, and rightful heir to the throne. Lambert takes his cue from the street actors he's watched and strives to become a convincing king. Will the friar's selfish motives turn into a disaster for Lambert or will he sit upon the throne of Ireland? Though Lambert nearly convinces himself, truth prevails and brings an unfortunate twist of fate. 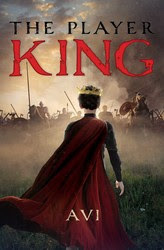 Readers of historical fiction will enjoy Lambert's adventure and may sympathize with his quest for belonging. A solid first person account of what might have happened in the history of Ireland.